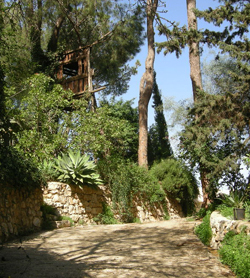 The Samen Eco Gardens are a unique organic botanical forest garden and farm that showcase a selection of ornamental and fragrant trees and plants, as well as, a large variety of subtropical fruit trees and edible plants. The garden and farm constitute a space of natural beauty and harmony, displaying the creative passion and loving patience of its owners. 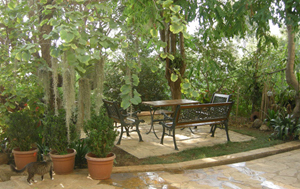 The owners of Samen Eco Gardens also offer consulting services, workshops and trainings on a variety of topics such as eco-friendly gardening practices, green roof and green wall designs and implementation methods, sustainable building solutions, living water systems, rainwater harvesting options, benefits of green architecture, various alternative health remedies etc. A seasonal selection of organic produce and products, organic homemade goodies, organic essential oils and hydrosols, organic gardening remedies, trees and plants, water energizing devices and much more can be purchased at the premises. We are always happy to show you around the gardens and farm. Please call ahead to ﻿schedule your visit﻿. We occasionally offer opportunities for hands-on learning. The various rental units at the Samen Eco Gardens offer an ideal opportunity to reconnect with nature and touch upon the inner musings of one's creative self; you can enjoy quiet moments of reflection or dive into action in the city and its surroundings. 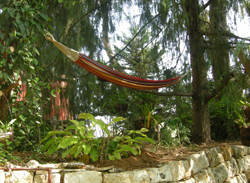 Whether you're wishing for a holiday retreat away from the common or you're seeking a central location from whence to pursue your business endeavors, we at the Samen Eco Gardens will do our best to make your stay with us in one of our rental units an interesting and memorable experience.